16th July is one of those dates . Sometimes you get one hit, better still to have two hits, but tomorrow I have no less than FIVE hits. Three of those are shown on the chart below. Today is a Fibonacci 89 Calendar Days from the 17 th April high. 16th July is a Fibonacci 55 Calendar Days from the 22 nd May high as well as a Fibonacci 34 Calendar Days from the Wave E low on 12 th June. Looking further out, tomorrow is also a Fibonacci 233 Calendar Days from the Wave 4 “B” wave high on 26 th November 2007 as well as 730 Calendar Days from the Wave 4 “B” wave high of 17 th July 2006 . 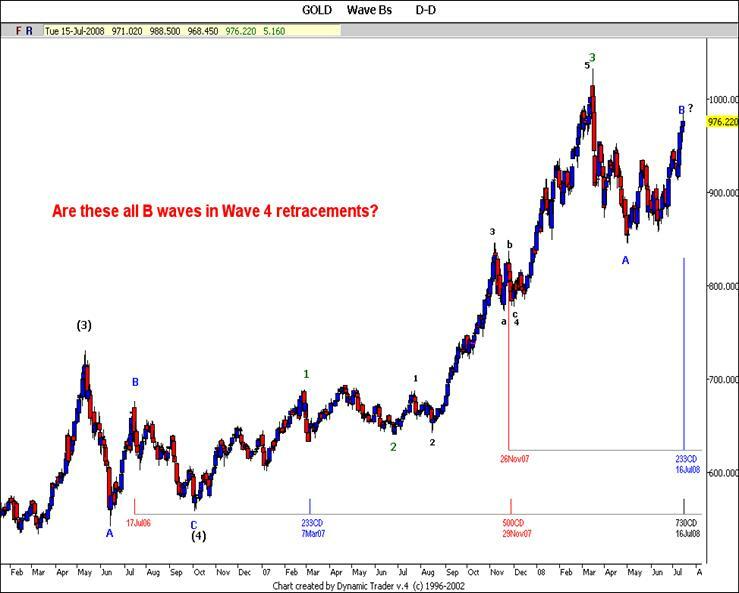 Could this mean that we are topping in the Wave 4 “B” wave now? Unlikely, but possible. It is interesting to note that both of these counts originate from “B” wave highs of Wave 4s. 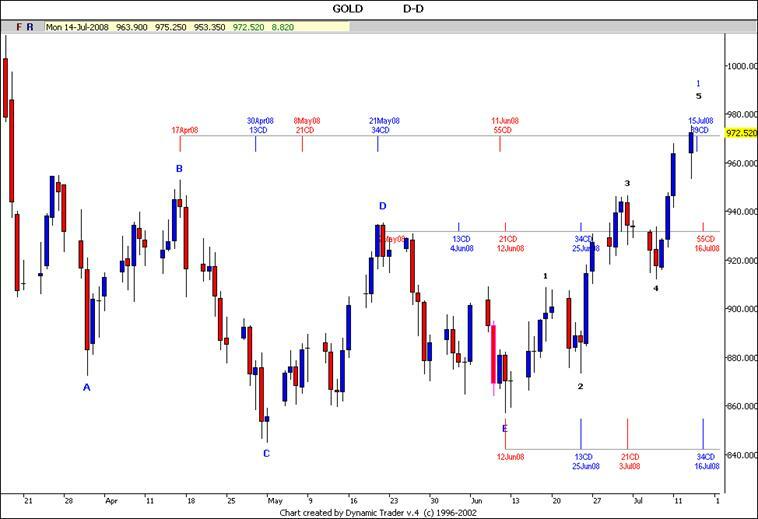 counts in Trading Days and come up with another very interesting cluster which also performs the Golden Triangle. 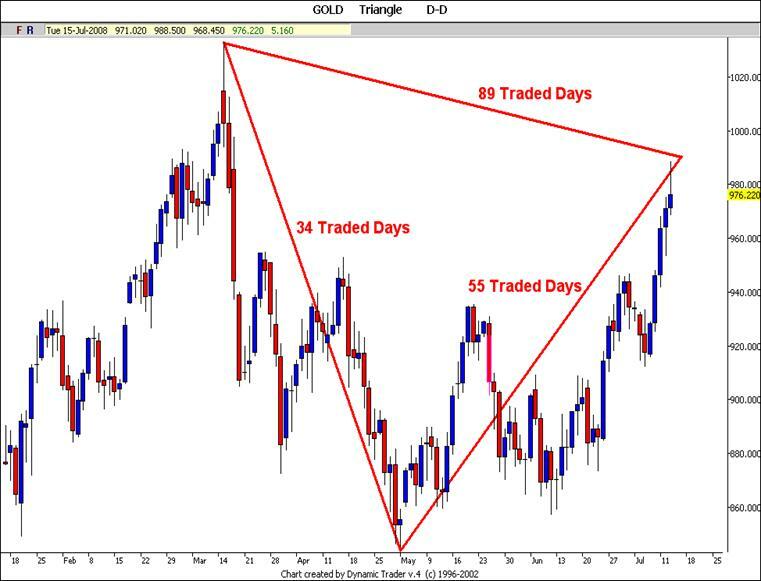 This Friday, 18 th July, is 55 Trading Days up from the 2 nd May low and that 2 nd May low was 34 Trading Days from the March 17 th high giving us a total of a Fibonacci 89 Trading Days from the March 17 th high. So, did we top today at $988.50, or will we top Friday? Today's high fits the bill as today wave 5 exceeded the length of wave 3 but if we are to climb to a higher high on Friday then I would be targeting $1,002.50. It is also worth bearing in mind that we either have today or will on Friday bring in both the DELTA MTD 4 and the LTD 4 on the Metals rotation. 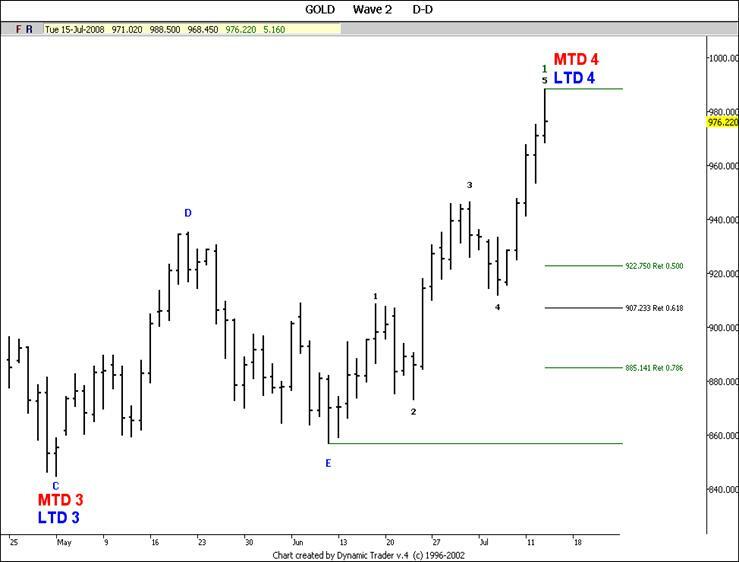 This means that we should have a wave 2 correction of between 50% and 78.6% which means that we are targeting a minimum retracement to $922.75 assuming that we have topped today. 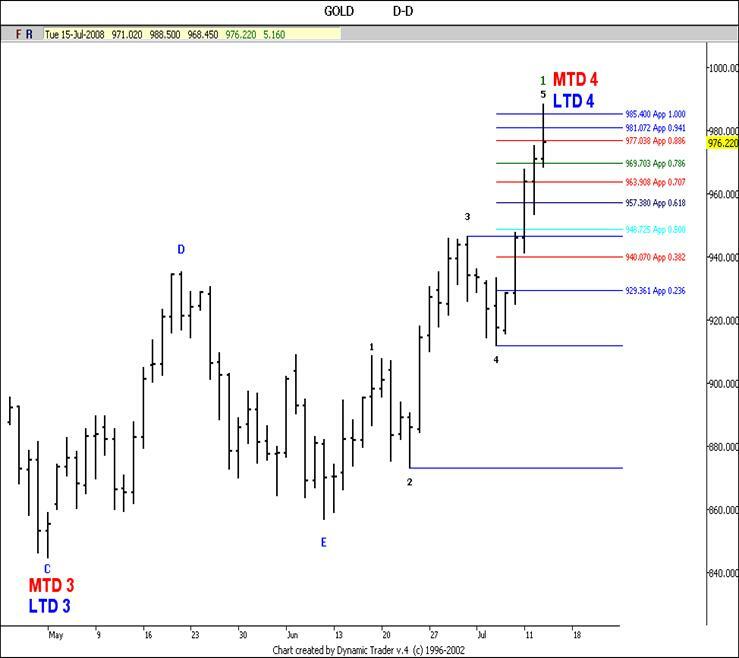 If we go higher over the next few days and exceed today's high I shall recalculate the retracement targets. To those of you stargazers, it is worth noting that Friday is also the Full Moon which often coincides with big shifts in the markets. I shall be trading this for the Trading Portfolio sometime between now and Friday and will post on the Bulletin Board when the trade is executed. 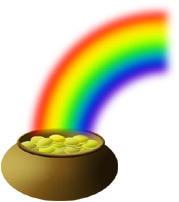 As usual, I will keep you posted via the Bulletin Board of any developments and targets as they emerge.